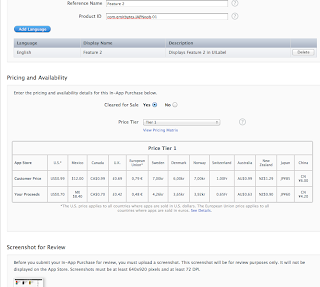 XCode Tutorials for Beginners: How To: Implement In App Purchase The Easy Way, Ever. For example, over at Ray Wenderlich (this tutorial), you can try read it, unless you are very familiar with classes and what nots, you'd end up like me - giving up to make IAP in your app. Don't get me wrong, Ray Wenderlich provides one of the TOP NOTCH tuts, but sometimes they just speak a different language than us, noobies and amateur coders. So I thought, since it is my first time to implement IAP in one of my apps, (I never had an IAP app before), might as well I try find my own way of putting an IAP which is EASY, STRAIGHTFORWARD, and FAST TO IMPLEMENT. 1. that you want to implement IAP by way of "feature" buttons. If these assumptions are what you are doing, then read on! For this tutorial example project, I'll just put 2 buttons on a single view app. One button is an example of a readily available feature and another button is another feature that requires an IAP to use. I also added a UILabel at the bottom just to do something when you press the feature button. For this example, I am going to make the label say "Feature 1" when you press button 1 and say "Feature 2" when you press button 2. But since Feature 2 is a IAP item, we need to check if user has purchased the feature before showing "Feature 2". Anyway, lets make the basic functions first. Declare 2 IBActions for the 2 buttons. And also declare IBOutlets for the IAP Feature button and for the UILabel in .h. Also declare a UIAlertView so that we can check for the user response in this alert later. Remember to synthesize both objects in your .m file. Now open XIB file and connect all the necessary links. Connect IBActions to Touch Up Inside of File Owner, and both IBOutlets. Note that we need IBOutlet of Feature 2 button because we are going to change the Lock icon condition later on. Having the button declared will make things easier later. Next, open .m file and write the methods for the button taps. Now run the app, both buttons should be working now when you tap it, the UILabel below will change according to which button you tap! Congratulations. No, you are not done. We want to lock Feature 2 now, so tapping button "2" should check for IAP first before allowing user to use it. For this purpose, we will create another method to check for IAP item somewhere.... Earlier, when I was learning how to implement IAP, I thought of using NSUserDefaultsto store some values (like a BOOL) so that we can set that flag if user completed an IAP. However, there is a problem with this, while it is simple, if user deleted the app, and redownload it later, the IAP flag will be gone forever - NSUserDefaults is stored as .plist file in the APP BUNDLE folder.... means user who already bought the IAP, needs to purchase the IAP again = angry users. Grr..
A better way to handle this is to make use of the KEYCHAIN. Now, we can learn to implement Keychain, but why reinvent the wheel? Head over HERE to download the KeyChain wrapper. After you downloaded it copy and include both SFHFKeychainUtils.h and .m into your project. (I've already included the files in the Sample project of this tutorial, but do download the latest version for your app). What is Keychain?Keychain is something like Registry in Windows. It is a more secure place to store sensitive information in the iDevice and it is not tied to the app bundle. In your .m file, remember to #import "SFHFKeychainUtils.h". We also need to add the "Security.framework" to our project. After that, lets create the method to check the IAP item in the keychain. We are just simply using the username/password saving feature of KeyChain utility to save our IAP item data. Nothing fancy. Also notice we are declaring this function as a BOOL, so it returns a YES or NO immediately when we call for it. Note that all 3 data here: username, password and ServiceName are developer defined. You choose what you want for those keys (they are all NSStrings). It does not matter what they are, as long as we can check for the "password". What we do here is check if the IAP item flag is available in the keychain, if it exist then user has purchased Feature 2 before, so we proceed with it's function. If not, prompt user to buy Feature 2. In this example, I just use a simple AlertView. You can code a pretty UIView with colorful images and so on - entirely up to you. Now lets handle the alertview feedbacks. If user chose to purchase, then we start the IAP request. Before we go on to that, lets create an IAP item in iTunesConnect first. Creating/Registering IAP Items in iTunesConnect. As for the screenshot, just upload a Dummy image of size 960x640 and you'll be able to save the IAP item. But you have to remember to update this screenshot prior to submission. The key info in this form is the Product ID. In this case com.emirbytes.IAPNoob.01 , this is what we will be calling from our app later. Once we are done we can then create Test Accounts to test the IAP later. In the main page of iTunesConnect, go to Manage Users, and click on Test User and add a test user. Once you are done, you can logoff and return to coding. // user tapped YES, but we need to check if IAP is enabled or not. message:@"Parental Control is enabled, cannot make a purchase!" First we check if the alertview is the IAP prompt alertview, if it is then we check if Yes button was pressed, and if it is, then we check "canMakePayments". This function will return YES or NO depending on whether the In-App Purchases Settings in the device is set to On or Off (Settings App -> General -> Restrictions). This way, the payment is allowable only if this restriction is not set (to prevent childrens from simply buying your IAPs unintentionally). And, if we can make IAP request, initiate the request with the Product ID that we specified earlier in iTC. Since IAP requires internet connection and takes some time (a few seconds) to be processed, at this point it is a good idea to check for internet connection availability and to display a Wait View (I do not include it for the sake of simplicity). For easier demo, I put another UILabel to show the status of purchase. [[SKPaymentQueue defaultQueue] addPayment:payment]; // <-- KA CHING! After we request a payment, the next delegate that is going to respond is the updatedTransactions delegate, where we check for transactions type: there are 4 types that must be handled properly. SKPaymentTransactionStatePurchasing - indicates still processing the purchasing - display a wait view. message:@"You have unlocked Feature 2!" First, in above case, we tell the server to finish the transaction, then we show to user that the Feature has been unlocked. Then, we register a flag in Keychain with the specific username, password and servicename (remember they are case sensitive). Finally we remove any Padlock icon and other visual settings. IMPORTANT: YOU CAN ONLY TEST IN-APP PURCHASE IN YOUR DEVICE, AND NOT IN SIMULATOR. USE THE DEVELOPMENT PROVISION TO TEST IT. AND MAKE SURE YOU LOG OFF YOUR OWN APPLE ID and USE THE TEST USER ID TO DO TEST THE IAP IN SANDBOX ENVIRONMENT! see additional notes. Oops! I forgot one more thing! Since you will be testing this in your device, you might want to test the IAP a few times. So we need to add another button (which will be hidden or just deleted when you submit the app) to reset the Keychain value. To test the IAP process again, just tap the button and delete the app in your device, and then rerun it. The app's Feature 2 should be Locked again. Ok, now we're Done! Yay! Reset your app - delete the app in sim, do Clean All in XCode, double check your provisioning profiles (reinstall them if necessary). Remember that bundle ID are case sensitive. Ensure to logout your iTunes Store account in Sim/Device and make sure you login with a test account to test the IAP. Check everything in detail. Also, I have verified that you can test the IAP in Simulator as well (I tested it using XCode 4.3.1 and Simulator 5.1). Thanks all for your feedbacks! what xcode version are you used? and ios? Have you added an IAP item in your iTunesConnect account? Also, double check your Product ID. They are case sensitive. You need to put in your own app id. And, you need to have added the application in the itunesconnect. And, you need to have the corresponding IAP items with the correct Product ID in Manage In-App Purchase section. I've done exactly what you did but with my Product ID and instead of unlocking feature 2, it removes ads by me. But I get the same alertview as SaveController says : No products to purchase. Make sure the ID matches completely (case sensitive). Btw, I am using XCode 4.3.1. iOS 5.0. Please note that if you just download my sample app and run it, it will NOT work, because those product IDs and Bundle IDs are fake ones. You need to change those to your own Bundle ID (com.yourcompany.yourapp) in plist settings and change the IAP product ID to your own (com.yourapp.item01). I am not sure who's username/password must be entered here? why would it still know that since i used the deletekeychain to remove all reference to the purchase? this again is being done on the simulator? The username/password is not really a username/password of anybody. It is just a text that YOU choose to register your in app purchase into user's device. 1. the purchase is not supposed to work in simulator because Apple prohibits StoreKit in simulator. If you can make it work, I guess Apple has allowed it recently? Not sure. 2/3. Your getting alert like that (would like to download again for free?) after you delete the keychain IS OKAY! It means it works fine. 1. Just wondering where its being stored is it on apple servers or local to my computer? if so can I remove the keychain from my computer? 2. Why isn't the (IBAction)deleteKeyChain function remove the keychain so that the retesting of the app provides me the same sequence of screens like before I executed the In App Purchase the first time. The keychain is saved in user device 'registry'. Exactly i have no idea where. Your deletekeychain already works. The value was deleted, you are getting a different msg from iOS (ie redownload the purchase) is because that is how iTunes server works- it disallows multiple purchases of same item from same user. Does somebody use this in production? If " it disallows multiple purchases of same item from same user" why are we using storeUsername and deleteItemForUsername. If i use deleteItemForUsername i still get the message that the product i already purchased. Well, I have used this in 2 of my apps already. Purchases are coming in fine. That storeUsername is to provide a better data saving compared to, say, NSUserDefaults. It is only for your app's usage to securely register the "bought" flag that your user made into the device. For example, if a user purchased your IAP, and then deleted your app for some reason. If you use NSUSerDefaults to save the "bought" flag, then when the user reinstall your app, your app IAP will appear to be locked again. This is because NSUSerDefaults is saved with the app bundle. Deleting an app, will delete the NSUSerDefaults data as well. Feature 2 will not be able to be used. So by using storeUsername (by right this is called Keychain), even after the user deleted the app, the "bought" flag is still there. And that is the ONLY purpose of Keychain in this example. Hope u can understand my explanation. Thank you for posting this and answering user's questions! It's helped alot! I got this to work the second try, yay! Your notes really help me understand what is going on. The only thing I couldn't get working is the function to delete the keychain entry. I replaced the username with mine, and tried using single quotes (') or (\") around the attributes (you cant have embedded double quotes) but to no avail. I am able to get this to reset if I create a different test user. Firstly thank you for your efforts. 1: I got the message: " Do you want to buy one Unknow app for $0.99?". Not " Do you want to buy one Feature 2 for $0.99?". Does this is correct? 2: When I try to buy the item again, I got the message" You already purhcase this...", this is expected behavior and what I want to know is where can I get is event message to unlock the item user bought? message:@"Your previously purchased products have been restored!" waiting for my first question. @ward i dont think the queue persists.. once the product is restored, why would there be an open transaction? My first time for IAP too..
is called before the transactions are restored. my restore function is still not working.. Thank you so much for posting this - it really helped me out! i get an error, i made a sreen picture of the error , and i cant fix the error plz help. and use it somehow to avoid paying for inn-app-purchase. Correct me if i am wrong.Tnx. Xcode says "paymentWithProductIdentifier is deprecated"
This matter maybe come from when you adding a framework kit. You have to choice the 'Target' correctly where this framework will be applied when you add this framework. @xuan -hy.....my paymentQueueRestoreCompletedTransactionsFinished is never called when i click restore button.? what u think would be an error. Great tutorial, I have one question. Can this work for in app renewal subscriptions. paymentWithProductIdentifier is depreciated in xCode 4.4.1...any idea guys? thanks!! Hey guys i got this error and warning when i copy pasting the Source Code to my new project. do u guys know how to solve it ??? okay, i'm sorry for my carelessness. i forget to put this code : #define kStoredData @"com.emirbytes.IAPNoobService" under the synthesize on my viewcontroller.m. the error is gone now but still have 2 warnings. do you guys know how to solve it ? I am never able to download the source. It keeps going round and round and tries to make you pay for the premium download. Can you send me the source to yooolie@yahoo.com? Thanks. We recently shared an open source library for in-app purchase on iOS. You can find it at http://project.soom.la. The library simplifies the Storekit API and can be used as an SDK or as reference code. We also included a sample app. This is the best tutorial for IAP thank you so much!,! Hi, there. Thanx for the author for this valuable post!!!! directly on the procedure you've used to manage each of the itens. Since this tutorial came out, Apple has altered their requirements for in-app purchases, now all developers are required to include a "restore" button, allowing users to access in-app purchases they had previously, well, purchased. As this isn't covered in the tutorial I figured I'd post the code that makes it happen just to save everyone some time and frustration. //The above couple lines are crucial to this working, do not leave them out. when i have test this app on simulator, it take username/password. So what details exactly entered, i am entering id and password but it,s not unlock what should i do to make unlock. @Brian T, thanks for your codes. actual store. So you need to create new test accounts. when trying to restore/purchase, DELETE THE APP in your device, and CLEAN ALL and rebuild and run again. Good luck all, and thanks for all the nice words. I just share what I know. Hi emir, thanks for your post, it works perfectly fine, But I have 3 products to purchase, product1, product2 and product3, I have a confusion here, how to check whether these products are purchased.Whether I have to create different IAPItemPurchased functions and if YES then where I should store the passwords for each product, because delegate functions are written only once. How I should check which item I am buying and accordingly show the message that you have bought this item and save it to key chain, I am not getting. Hey Emir, KeyChain works for saving only one user/password , I have 4 products to buy, and user can buy each product individually, so I should store the data for each product separately in keyChain. I solved my last query through this tutorial, can any one suggest auto-renewable In-app Purchase. !!! I tried to download and execute the code in the simulator. I get the following message "you've already purchased this in app but it hasn't been downloaded"
Sorry I can't answer all questions (busy making my own apps etc) however I appreciate all the interest on this blogpost. Ranjit: yes, if you have 4 products, then you will need 4 pair of user/pw data. Prasanna, if you are getting that message, means it works. If iOS detected that you have purchased the feature before, then that is the prompt you will get forever. (unless you change the IAP Ref ID). Great tutorial without any unnecessary fluff. Get empty list back from productsRequest? Try to change the product identifier from "com.emirbytes.IAPNoob.01" to "01"
Only the product id seems to be enough now. Getting deprecated error for paymentWithProductIdentifier? validProduct is defined in the line above. Want to change to your test account on the device? Then upload your app and start it. You will now be asked for login and pass. Do not enter these data in Settings -> Itunes & App Stores -> Signout because you will have to give CC details and your test login will probably not work as a test login anymore. Error connecting to process 0, want to change the login id or other IOS Simulator errors? "Sending 'InAppPurchaseManager *const __strong' to parameter of incompatible type 'id<SKPaymentTransactionObserver>'"
Following one of Ray's GREAT tutorials, i implemented IAP however i run into an issue towards the end which is downloading the content the user has just purchased. Ray left this part out in his tutorial so i decided to do some research and implement coding so that the user can download their purchased content and then with the same code place the content from the directory it was downloaded and back into the app for the user to access and use. i have this persitent error that says "Use of undeclared identifier 'MyConfig'" is there anything else i can swap that with? How do i fix those? or what should i add to the code..
As a continuation to Ray's IAP IO^ tutorial, To automatically download the purchased content and transfer it back into the app or view controller and let the user access it - would also be nice to show a progress bar for the download. Please, all suggestions are welcome!! Thank a lot, for your tutorial, it helps me a lot. Just wanted to thank you and other contributors for very informative, helpful tutorial and posts. I've used bits and pieces of it to build my own in-app engine for iOS. Keep doing great job and I hope you received my donation too. This will be my 1st in-app purchase app with auto-renewal process. Great Tutorial. I'm finally able to start the app purchases with your tutorial, but not to fast. It work perfectly, but it opens all the products. I'll explain: The consumers will record how many objects they want to. But they need to pay to see advanced features for each one. Your code make the purchase, but open all the objects, did you know what I'm trying to do? What do I need to make each purchase open only one object. 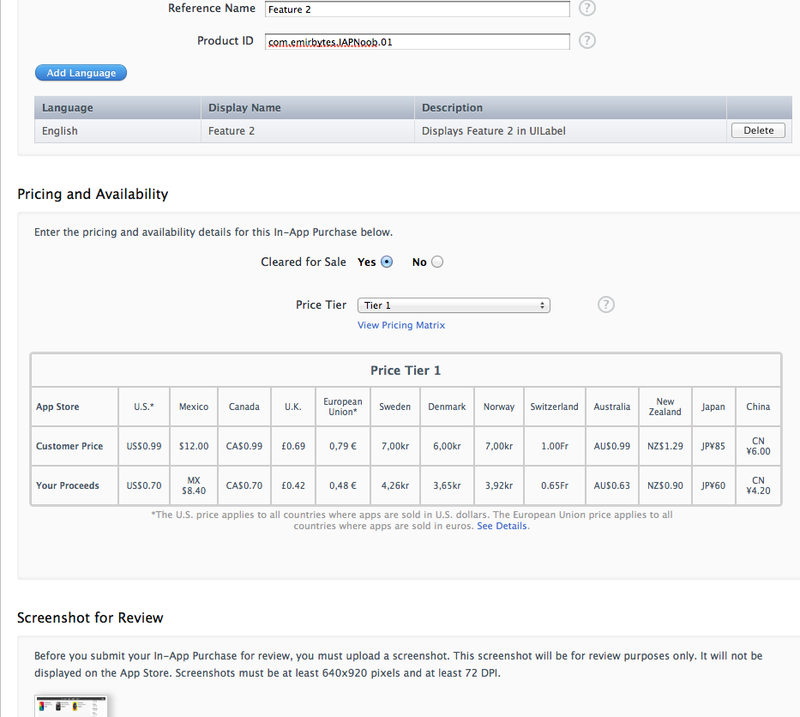 Those objects are on a table views and the purchase button are inside those details cells. Could someone paste the code for this, including the deprecated fix. I will pay the first person to post a working code via paypal. $20 is waiting for ya!!! Sorry, offer is expired. Found this. Way easier to modify. this code is missing the restore previous purchase feature so edit this code when use.. 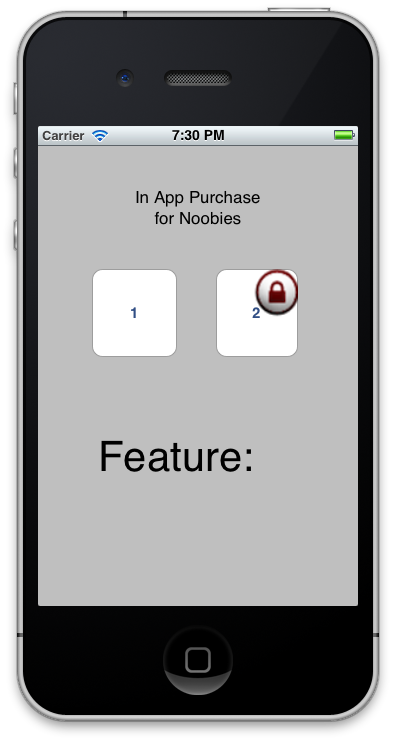 I was able to implement this code in my app for one IAP, but have been unable to add a second button with unlockable content. Anyone have any success with adding a second IAP in their app with this method...and have any tips? Thanks. How do you know if it is a free trial and if it is expired does it automatically start billing them or do they have to purchase again ?